Want to share Google Analytics reports with other users? With Google Analytics, you can grant limited or complete access to your account as well as to various Analytics reports. 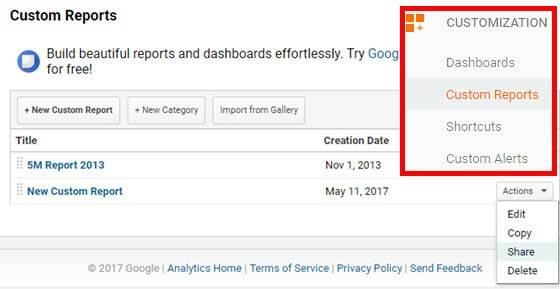 In this tutorial, we’ll show you 3 different ways to grant access to your Google Analytics account and share your reports with other users. Why Share Access to Your Google Analytics Reports and Account? 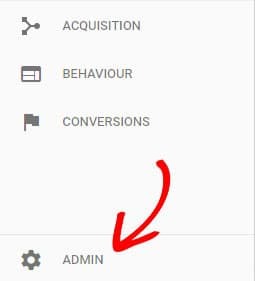 While you can connect only 1 Google Analytics account with 1 website, you can share access to your reports and account with multiple other users. When you’re working in a team, sharing access to your Google Analytics reports and account is important. By granting access to other users on your site, you can show them how their teamwork is actually working. When they can see how their work is performing in a visual way, they’ll be motivated to do more. Also, you can build group strategies based on the shared reports. 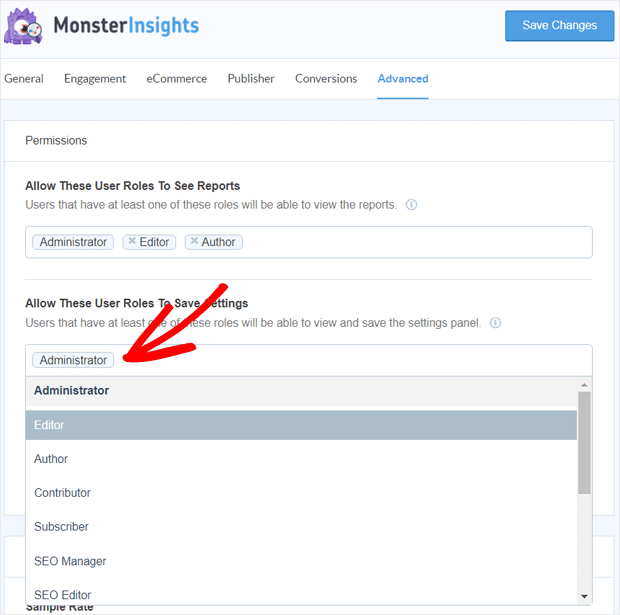 The easiest method to grant access to your Google Analytics reports and settings is to use MonsterInsights. MonsterInsights is the most popular, user-friendly Google Analytics WordPress plugin available on the market. The plugin makes Google Analytics super simple for WordPress website owners. It lets you install and use Google Analytics in WordPress effortlessly. The plugin helps you to track your most important Google Analytics metrics and provides you with the extremely comprehensive reports. Best of all, you can view all your reports right in your WordPress dashboard without having to navigate away to other sites. The plugin enables you to share access to your Google Analytics reports and settings in just 2 easy clicks of your mouse. 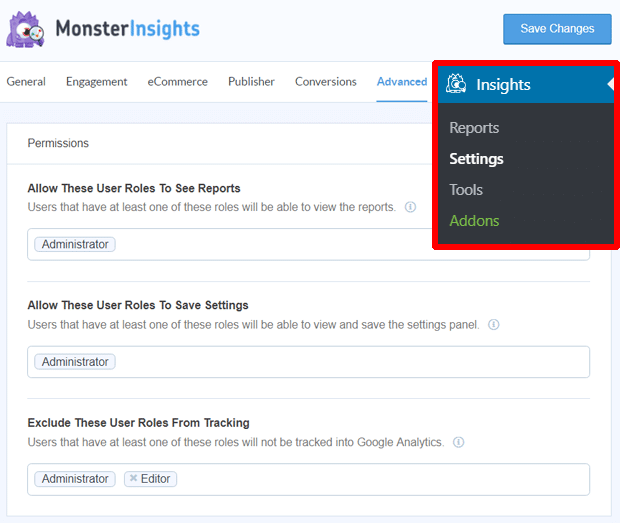 Before we show you the steps, make sure that you’ve connected your site with your Google Analytics account using MonsterInsights. 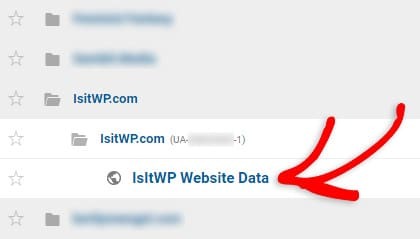 If you need instructions, here’s our step-by-step guide on how to properly set up Google Analytics in WordPress using MonsterInsights. Once you’ve completed the setup process, you can go to Insights » Settings and click the Advanced tab. Now you can see your the user permission settings. 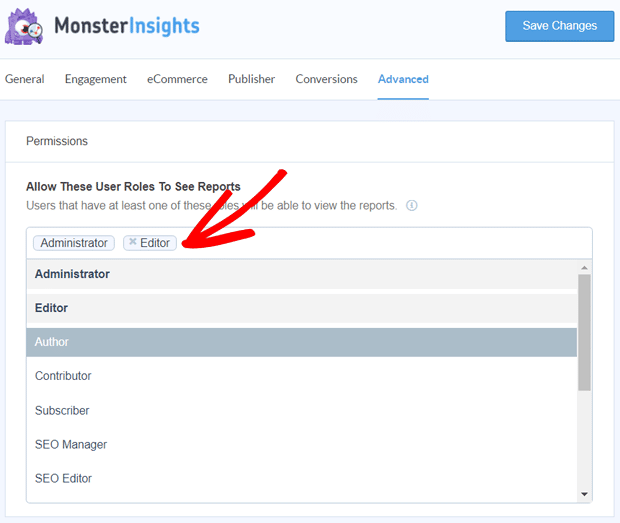 For example in the screenshot below, the users with the Administrator and Editor user roles are able to see your MonsterInsights reports. If you want to allow the authors as well, you can easily them. Similarly, select the user roles whom you want to grant access to save settings. That’s it! Now your selected user roles (administrators, editors, authors, or other user roles) will get access to your Google Analytics dashboard reports and settings. Not only is it the simplest method to share access to Google Analytics reports and settings, but it’s also the most efficient process. Your editors and authors can simply navigate to your Insights menu in your WordPress dashboard to find the reports they need. It saves time and makes your team members ultimately more productive. Account: This grants access to all data in your account. Property: This grants access to all data for 1 website. View: This grants access to limited data from 1 website. You may want to grant access to a particular website or full access to your colleagues in your organization. In that case, you can grant property level access and account level access respectively. If you hired a PPC consultant and want to share only AdWords reports, you can grant view level access to your AdWords report. If you’re a publisher and want to share only certain stats with your writers and advertisers, you could create a limited-access view and share it with them. First off, log into your Google Analytics account and select the right website on the Accounts page. Now, click Admin on the left taskbar. You can find the User Management option in all 3 columns: Account, Property, and View. You can select User Management in any column based on the level of access you want to grant to other users. For the sake of this example, let’s select User Management in the Account column. 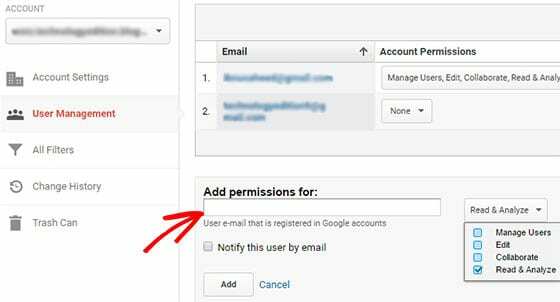 In the Add permissions for field, enter the email address of the user you want to grant access to. In the dropdown menu next to the field, you’ll find 4 different options: Manage Users, Edit, Collaborate, and Read & Analyze. Choose the appropriate field and then click Add. Custom Report lets you build your own reports by choosing dimensions and metrics you define per your needs. It also offers greater flexibility than your pre-configured reports because you can choose up to 5 dimensions for each report. For example, if you want to get a customized Analytics report from your SEO clients, you can ask your clients to share a specific custom report with you. Rather than asking your clients to create a custom report from scratch, a link to the custom report template can be shared with them. When it is clicked, they’ll be prompted to choose a profile in which to import the custom report along with instructions showing how to add it to the View that you shared with them. To share a custom report template, select the right website in your Analytics account. Navigate to Customization » Custom Reports. Click the Actions dropdown menu, and then click Share. To share a template link, click Share template link and then click Share. Now a link will be generated. You can share it with your client so they can import the report to their profile and then use the custom report without having to create it from scratch. To share a custom report with another user, click on any custom report by going to Customization » Custom Reports. 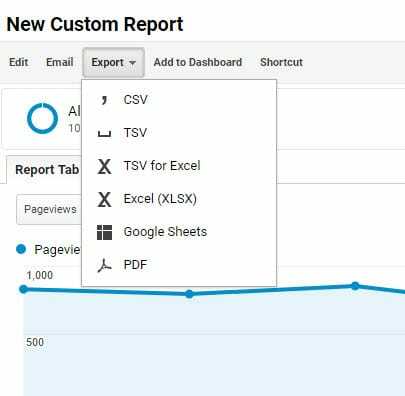 You can either export the custom report to different formats such as CSV, TSV, TSV for Excel, XLSX, Google Sheets, or PDF; or email the report to a specific user. We hope this article helped you learn how to share Google Analytics reports with other users.